The attacks took place between 2001 and 2004. According to the civil complaint, the terrorists were either on the payroll of the Palestinian Authority or the Palestine Liberation Organization. Their families later received martyr pay and other forms of support from the Authority. The case, brought under the U.S. Antiterrorism Act, has vast potential ramifications. In addition to hundreds of millions – if not billions – of dollars in damages if the PA is held liable, it could affect U.S. political and financial support for the cash-strapped Authority. In 2008, the presiding judge rejected the defense's argument that the attacks were acts of war rather than terrorism. It took 10 years for the case to go to trial. But it comes as the PA is in a precarious situation politically by its own actions. Israel is withholding $127 million in tax revenue and the United States is considering its own sanctions after the PA tried to get the United Nations Security Council to declare statehood without negotiations and after the PA applied to join the International Criminal Court. A last-ditch attempt to delay the trial was rejected last week by the Second Circuit of Appeals. A significant judgment against the Palestinian Authority could give the United States some leverage in getting PA President Mahmoud Abbas to back off the unilateral moves, said Jonathan Schanzer, vice president for research at the Foundation for Defense of Democracies. "You're looking at a Palestinian Authority that has eroded a lot of good will that was built up over the nine months of the Kerry negotiating process, where Abbas largely came out looking like the good guy," Schanzer said. "I think that good will is now being eroded and I can certainly see Congress looking to withhold additional funds." But, Schanzer points out, until the case is resolved, it's premature to guess what political fallout might result. After rejecting a defense motion for summary judgment in November, U.S. District Judge George Daniels ruled that the case could proceed to a jury trial, rarely conducted under the U.S. Antiterrorism Act. If evidence showing the PA had later promoted people tied to terrorist attacks or provided benefits to terrorists and their families, a reasonable jury can find the Authority liable, he ruled. Muhanad Abu Halawa, a PA employee, and three others carried out a machine gun attack on a car which wounded Varda, a father, and Oz Joseph Guetta, his son, when the boy was just 12 years old. Varda Guetta later identified one of the shooters as a member of the PA's Force 17, a commando unit which guarded then PA-leader Yasser Arafat. Others in the attack later implicated the same man, Fawzi Murar, whose family received martyr payments after he died the next year. Two elderly women were killed and 45 more people injured in a machine gun attack in downtown Jerusalem's Jaffa Street. The shooter, Said Ramadan, was a PA police officer. The attack was planned by Ahmed Barghouti, whose cousin Marwan Barghouti was a senior official in the PA's controlling Fatah party. PA records indicate that PA employees involved in the attack continued to receive pay and promotions. Ramadan was killed in the attack, but PA documents described him as a martyr who died "performing his national duty." Wafa Idris became the first known female Palestinian suicide bomber, killing an 81-year-old man and wounding 150 others on Jaffa Street. Among the injured was lead plaintiff Mark Sokolow, his wife and daughters. Idris worked with an official in the PA's military intelligence office in planning the attack. That official later was promoted. Idris received martyr status which brought monthly payments to her family. Three people are killed and 80 wounded in a suicide bombing on downtown Jerusalem's King George Street. The bomber was a PA police officer who had been arrested for plotting a terror attack a month earlier, but released by Palestinian security officials. He was assisted by a lieutenant in the PA's General Intelligence Service, who received money for the attack from Marwan Barghouti. The lieutenant, Abel Karim Aweis, later admitted his role in Israeli court. He stayed on the PA payroll and was promoted four times afterward. The bomber's family received martyr pay. Nine people, including five Americans, were killed in a bombing at a Hebrew University cafeteria. Hamas took credit for the attack, but it was "planned and carried out by Marwan Barghouti, Ahmed Barghouti" and other PA employees, the complaint says. As in the King George Street bombing, PA officials arrested the bomber before the attack, only to release him. The bomber, Abdullah Barghouti, was provided a safe house and bomb-making materials by his relative, PA official Marwan Barghouti. The PA's Ministry of Detainees' Affairs later gave Abdullah Barghouti's family monthly payments. Eleven people were killed and 50 wounded in a suicide bombing on a Jerusalem bus. Four PA police and security officials later admitted to participating in the plot and making the bomb. The PA paid the families of the suicide bomber and those later jailed for their participation in the attack. 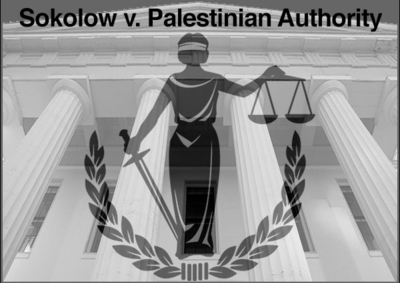 To prove their case, attorneys for the victims plan to show the jury internal PLO and Palestinian Authority records seized by Israel during incursions into the West Bank. Among them is a 2002 report about West Bank operations sent to the head of the PA's General Intelligence Service. In it, one squad is lauded for "high quality successful attacks" and praised as "the most disciplined." "Its men are very close to us (i.e. to the General Intelligence) and maintain with us continuous coordination and contacts," the report said. Another exhibit indicates the PA was spending "$5-$10 million per month for its expenses in the confrontation against Israel. Some of this sum is in money and some in goods – fuel and arms." The view in Washington is that the PA today is vastly different from the one run by Yasser Arafat during the years covered by the Sokolow lawsuit. Abbas is credited with ending the intifada in which these attacks took place and with eliminating the entities which organized terror attacks. "Nevertheless, it is still the government," Schanzer said. "And the government is responsible." The current PA, its officials and media arms, also continue to glorify terrorists by naming public places in their honor and praising recent attacks. Shurat HaDin, the Israel Law Center, is working with the victims. In a recent release, center director Nitsana Darshan-Leitner said evidence obtained during the discovery process shows that the PA and PLO continue to provide "benefits for terrorists who carried out the attacks ... This clearly demonstrates the PA's wide policy of providing incentives and financial rewards for terror acts." In pre-trial filings, defense attorneys cast the attacks as the responsibility of a "variety of disparate Palestinian individuals and groups ... with no apparent connection to one another." Many of the exhibits shouldn't be admitted into evidence, they argued, saying they can't be authenticated or are little more than "rank hearsay." They indicated they could call top PA officials to rebut the allegations, including former Prime Minister Salam Fayyad, Brigadier General Khaled Abu Al-Yaman, head of the PA's General Intelligence Service operations department, along with GIS director Major General Majed Faraj. The Manhattan federal court trial is expected to last several months. Sunday, Jan 11, 2015, was a Lincolnesque moment for world democracy. France once again stood tall. In Paris (and in other French cities) the people rose up to choke their main plazas, in drizzle, and, in almost one celebratory voice, spoke more forcefully than their weak leaders. A young French-born Muslim woman carrying a sign "Je Suis Juif" was eloquent in her CNN interview of the event. She became the spontaneous moderate Muslim spokesmen the West has been looking for in vain in Muslim countries. The high-ranking representatives from around the globe seemed gray and indistinguishable in their arm-in-arm façade of unity compared to the signs, the cries, the clapping of the glorious unity of the million-and-more crowd. Their frontline B-team ranking was cemented by the only real A-team leader, Angela Merkel, with her genuine quiet strength. That Obama missed the train on this Democracy Day vs World Thuggery (still represented by Abbas, who complicated the whole picture) made it seem Charliesque. A serious disconnect for America. Meanwhile, the Investigative Project on Terrorism is making headway after 10 years against the PA in a $1 billion law suit for terroristic acts (crimes against humanity).